I was just 12 years old when I started writing music, which as crazy as it sounds to me, is over 15 years now. A couple years after I first picked up the guitar, I started a screamo punk band. We wanted to record an album, but studio time is expensive, especially for junior high kids. I went online looking for options and I found this amazing world of home audio production. A few years on, life took some unexpected turns and I took a break from creating music. Music was still a large part of my life and I was a radio DJ for my university’s radio station. In my last year attending college, one of my best friends started a chillwave project and released an album, the Sketchbook EP (by Adam Stewart). I was amazed at the quality he pulled out of just a small MacBook and headphones. In the following years I dove head first into producing guitar-based chillwave & glo-fi myself (artists like Tycho, Bibio, Kyson & Slow Magic) and rediscovered another side to the world I had found as a kid. Then around 2014 my brother started sending “future bass” tracks my way (artists like Kasbo, Wave Racer, San Holo, Snail’s House & Just a Gent); it made a large impression on my taste in music. Four years on and I listen to a wide variety of electronic genres, but these two are the foundation of my production. Chill is known as one of the most complex genres to produce, how did you manage to develop such great mixing skills in such a short time? Also, what is your studio setup like? Even with my earlier musical experience, it took a few years to develop skill and confidence. 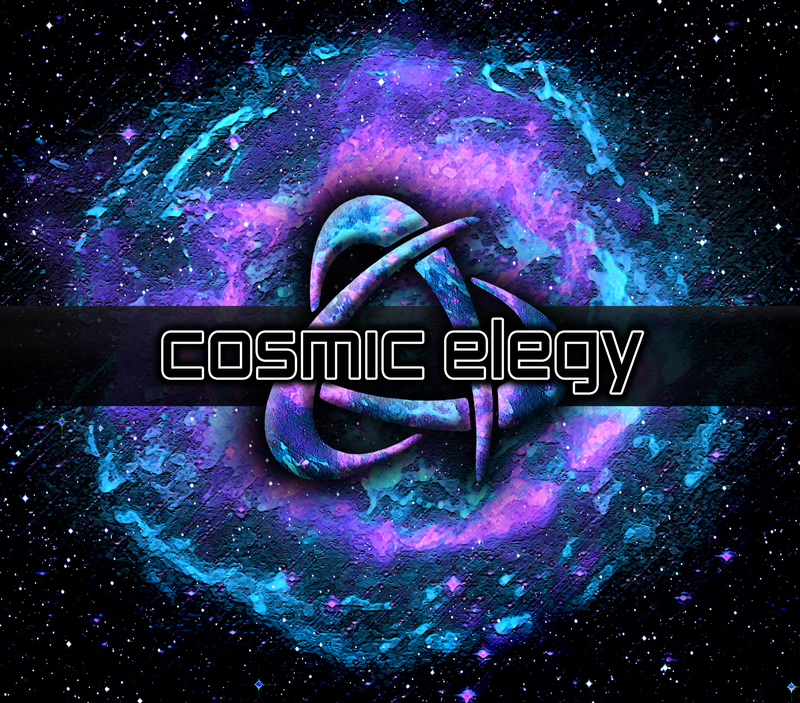 My first few Cosmic Elegy releases were creative, though not well mixed. I wrote my first tracks around 2013 with Reason since my friend used Reason for the Sketchbook EP, but after meeting another producer in Fayetteville (BlinkBlink) who uses Ableton as his DAW, I made the switch. Ableton Live was the right platform with it’s wide variety of controllers as well as VST support. I also use Ableton for my live performances. My foundation for producing came from watching Sadowick tutorials (shout out to him, he’s dealing with similar issues to what my family went through) and other tutorial creators on YouTube and Reddit. Since I was young I’ve built my own gaming computers; when I started producing I already had a capable setup and I slowly added the extras which streamlined the creative process. My studio setup includes an APC 40 mkii, APC mini, Novation LaunchKey 25 and an Alesis drum pad with Ableton Live 10 as well as a Behringer UMC404 audio interface with a Mackie mixer plus an ocean blue SX Hawk guitar and a white SX bass (they’re inexpensive, but I love guitars from Rondo Music). For playback I switch between ATH-M50xs headphones and then M-Audio monitors, Klipsch speakers and a Klipsch subwoofer. When it comes to effect plugins I utilize the stock Ableton Live effects, LFOTool and fabfilter effects most of the time; for synths Massive & Serum are my go to, but my “secret weapon” is this amazing VST called Phonec by Psychic Modulation. It replicates a “vintage analogue” synth and the new Phonec v2 added so much to the already superb synth. Your latest track “Astral” is your best track in our opinion! From its artwork to the Incredibly powerful sound we absolutely love it. Could you tell us more about the story of this track? Also, what is your creative processes like? Thank you! ASTRAL is the first track that truly represents my vision for Cosmic Elegy. The first version of ASTRAL came about in a couple days in November of last year, but in March I started rewriting and adding a lot more energy to the track. I uploaded the original version to Bandcamp as a downloadable extra when I released the final version. It’s the same composition musically, although the two versions sound vastly different. The original version is slow and repetitive, but I’m stoked at how the final version of ASTRAL turned out. I’m glad you guys love the artwork as well. I’ve always had a passion for web & graphic design and I designed my logo, website & all my own artwork. When I released Let’s Go! In late 2016 I was surprised and pleased with the positive response. It will always be one of my favorite tracks because of who I wrote it for, but creatively I was just following a pattern I found in similar tracks. It took a year of writing tracks every week after that release to find a unique sound. Chill electronic is an easy genre to begin producing, but very difficult to master and make your own. I start tracks with the melody and then work from there. I always rework songs a few different times. It has its benefits and weaknesses; It allows me to experiment and learn, but at the same time I can’t wait a year between releases again. I’m really happy with the sounds I’ve crafted lately, so I don’t plan on waiting long again. We haven’t seen any remixes on your Soundcloud, do you plan to release some in the future? The only remix I’ve released publicly is my remix of Tycho’s A Walk called Spacewalk. I released it after Let’s Go!, but I wrote the majority of it in the Spring of 2016. Remixes are definitely in my plans for the future. I have a collection of remixes I play live, but I don’t plan on releasing any of those until after my next few original tracks debut this summer. Every musician/producer dreams of a career doing what they love. Nothing in my life has been easy, but I’m building the pieces of what I’ve dreamed about for a long time and five years of hard work can go a long way. Along with producing and playing live shows, I host & promote semi-monthly shows in my hometown as well as running a small merch website (http://futurenova.pro) for myself and a couple producers from here in Fayetteville, Ark. It’s just a small part of my time right now, but I’m expanding into graphic design and web-hosting for other producers later this year. Fayetteville will always be my homebase, it’s the most artsy metro in the state and a hub for electronic producers, but I’d love to tour around the country. Music has always been an escape for me; even if it’s not my full time job I plan on doing what I love for the foreseeable future. Steady releases & playing more regional shows are my only goals for the moment. My plan is to release an EP this summer, but I haven’t decided for sure yet. Either I’ll release an EP in July if I find a common theme between the tracks or release a new track each month in June, July & August. ASTRAL is the first track that truly represents Cosmic Elegy and I’m building on that sound for these next few tracks. I’ve been listening to innovative producers like Jaron, Akari, k?d & Hex Cougar; I hope to blend some of their vibes into my sound. When it comes to live shows, I’ve been fortunate to open a few tours that have come through my area, but since the beginning of the year I’ve been looking for shows outside Arkansas. I played my first festival in Missouri recently and coming up in June I’m playing my first major show in Oklahoma with Subkulture Productions (UNDERLAND at the Yeti). During my live sets I control interactive lights and visuals with an Enttec DMXIS & Ableton Live as well as play live guitar, bass & play some beats on my Alesis drum pad; I’d love to share the hard work that goes into my live shows with a wider audience. I’ll be filming, editing and releasing a video of the Tulsa set on my website & social media, so be sure to check that out in late June as well as my tracks coming this summer. Thank you to HBT Magazine for the interview!